Crabbing in the Currituck Sound is a fun and easy activity that people of all ages can enjoy. To go crabbing, you will need a net, string, and some bait (chicken necks and fish heads work well). All of these items can be purchased inexpensively at a local Outer Banks bait and tackle shop or convenience store. First, be sure to place your bait in a cooler, so it stays fresh. 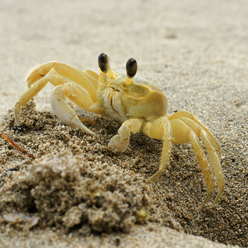 Crabs will avoid spoiled bait. Next, tie a piece of bait to a string long enough so the bait will settle at the bottom of the water. Drop your bait into the water, hold tight, and wait for a bite! Then, slowly pull up your string and gather your crab into the net at the surface of the water. Enjoy Crabbing on the Outer Banks! The Whalehead Club offers great sites for crabbing, from its public boat access, pier, bridge, or gazebo. There are also many good sites on the Currituck Mainland and on Knotts Island. Enjoy your Outer Banks Vacation with great crabbing and fishing!